"I entered the little rural happy looking village of CLIPSTONE. I say happy looking, and when I tell you that the labourer's cottages have all the neatness and beauty of country villas, with their trellised porches, climbing honeysuckles and blushing roses, in addition to gardens, homesteads, and cottage cows, you will think that I use the term advisedly. 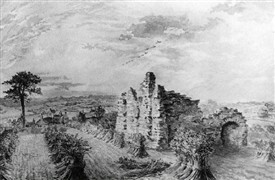 "This village although now a comparatively obscure hamlet, was evidently at one time a place of much importance; some writers even asserting that during the Saxon heptarchy a palace was built, and occupied by one of the Kings of Northumberland, be this as it may, it is certain that it was a Royal manor, and possessed a Royal residence, very soon after the Norman conquest, and that it was a frequent and favorite residence of King John".